Myofascial Pain Syndromes constitute a large group of muscle disorders characterized by the presence of hypersensitive point, called trigger points, within one or more muscles, the investing connective tissue, or both, together with a syndrome of pain, muscles spasm, tenderness stiffness, limitation of motion, weakness, and occasionally autonomic disfunction. The trigger point is so named because its stimulation, with pressure or activation of the muscle, is like pulling the trigger of a gun, producing infects at another place (a target), called the reference zone or e area of reference. - pain exacerbated by stress. These syndromes have been previously described as, among other terms, myalgia, myositis, fibrositis, myofascitis, fibromyositis (or myofibrositis), muscolar rheumatism, and muscolar strains. Myofascial pain syndromes are most common musculoskeletal disabilities of the shoulder girdle, neck, low back, and, to a lesser extent, the chest and ribs. They are certainly among the most frequent causes of severe disabling pain. Moreover, because of the peculiar symptoms associated with these syndromes they were not generally recognized until recently. Consequently, they were often misdiagnosed and treated as borsitis, arthritis, or visceal disease. The most easily identified caused of myofascial pain syndromes are trauma to myofascial structures and acute overload of muscles. After acute injury, trigger points (small, circumscribed, hypersensitive regions in muscles or connective tissue) can be identified in some individuals. Impulses arise from this points and bombard the central nervous system to produce local or referred pain, or both, and associated phenomena in the area of reference. The only manifestation may be minimal loss of range of motion (ROM), coolness, quick fatigability, slight loss of dexterity in the upper extremities, or a combination of these. Residual clinical stigmata are seen most often in conjunction with injuries to the extremities in association with cervical or lumbar/sacral pathology. ln the presence of an injury pool, any additional injury or stress involving the same segment can cause a flare-up of latent trigger points. Under these conditions, an insignificant event can initiate bizarre responses, including intense severe pain, prolonged edema, loss of ROM and slow recovery-many of which could be construed as psychosomatic. Latent TPs can also be activated by intense heat or cold or by prolonged chilling, as occurs with air conditioning or chilly, damp whither. In these cases, the precipitating factor is not readily identified, or the relationship might be overlooked because the painfulness of the myofascial syndrome is disproportionate to the significance of the incident. A third etiologic pattern for myofascial syndrome is slow on-one set, in which the microtraumas of daily activities or repetitive movements while working, such as prolonged typing, result in overload fatigue. ln addition to these precipitating factors, a number of factors can make a person vulnerable to development or activation of latent trigger points. These include mechanical stresses that overload muscles, such as occurs with a short leg, small hemipelvis, poor posture and prolonged immobility. Travell and Simons also mention that a variety of nutritional and metabolic and endocrine factors, including vitamin deficiencies, mineral inadequacy, hypometabolism, and endocrine dysfunction (particularly estrogen deficiency and hypothyroidism) are important predisposing and perpetuating factors. They also list chronic infection due to viral or bacterial disease and parasitic infestation as predisposing or perpetuating factors. An acute episode of myofascial pain often follows overuse of unconditioned muscles (the weekend athlete); excessive zeal in fitness programs; prolonged stresses on musculoskeletal structures due to poor posture during activities such as computer oriented work or television watching; sports injuries; automobile accidents involving cervical or lumbar sprain, or both; or a period of intense emotional stress. Travell and Simons point out that there is a difference between soreness after exercise and the TP phenomenon. They note that muscles that are stiff and sore from exercise do contain tender points, but the tenderness is not similarly referred to other areas and it is distributed ''as if it were caused by sensitisation with a different noxious agents or by the sensitization of a different neural structure than that responsible for the trigger point phenomenon”. The precipitating factor for primary myofascial pain is often a seemingly innocent activity. Among the more common on these is a change in heel highly from high heels worn during the day to slippers in the evening. Other examples are working at a table or counter that is too low, sitting in an overstuffed chair, and riding in an airplane or car (in these instances, vibration is added to the postural and environmental stressors, which include the handling of heavy luggage). An afternoon of shopping cart be the precipitating event, particularly when the person has been walking in leather-soled shoes on highly waxed floors, which are common in shopping malls and many other public areas and institutions (nursing homes, convention centers, schools). The muscular accommodation necessary to maintain balance in these conditions, plus abnormal adjustment of gait, can aggravate muscles with existing trigger points, causing acute onset of pain in hips, knees, ankles, feet, low back, head, or neck. Frequently, more than one TP area is found in pain syndromes, each having a site of reference comprising a portion of the pain pattern. A prolonged barrage of noxious impulses from a TP area is conducive to the creation of secondary tender areas in the zone of reference. In such instances, the more recent secondary foci can be a major source of pain, and it is not until these are eliminated that the primary focus becomes evident. Although trigger areas can develop anywhere in the body they occur most frequently in the neck, shoulder girdle, low back, and extremities. Present knowledge of myofascial pain syndromes and trigger point phenomena depends heavily on clinical observations ad theories the relate limited physiologic data to physical findings. Trigger points can sometimes be palpated (their presence is more commonly estabilished by the pain response of the patient when pressure is applied to them). Hypersensitive trigger point have been studied histologically, but there is little experimental evidence to substantiate their role in causing or perpetuating pain. Muscle tissue biopsed from tender areas in patients with primary “fibromyalgia” had a “moth-eaten”appearance. In these patients, adenosine triphosphate and phosphocreatine level were reduced, lactate values were normal, and glycogen concentrations were below normal. These findingd led to conclude that the TP phenomenon could be caused either by a primary metabolic disturbance or by overload secondary to muscle tension. There is little doubt as to the reality of trigger points, but there is great diversity of opinion as to how there points become hypersensitive and how they produce pain. Cailliet suggested that trigger opints are caused by the presence of blood and extracellular material that are not reabsorbed after damage of any type to soft tissue. 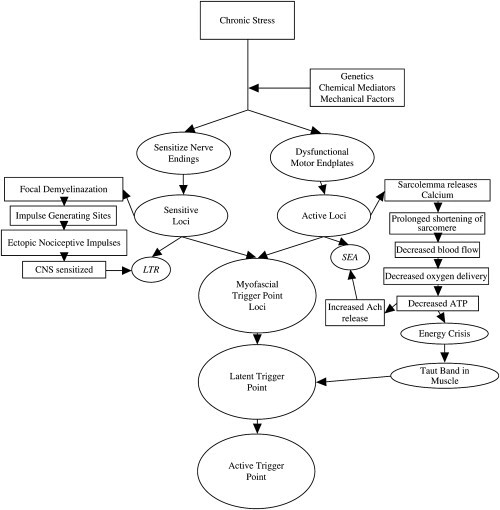 According to Gunn, the cause of trigger point hypersensitivity is neuropathy of the nerve serving the affected muscle (Cannon's law of denervation states that any structure affected by denervation responds with hypersensitivity). Supersensitivity associated with neuropathy has been supported by studies of Lomo, which show increased sensivity of muscle to acetylcholine and a broadened distribution of acetylcholine receptors. The muscle fibers ''hosting'' the t rigger points are contracted for an extended period of time, and muscle fatigue develops. Local ischemia occurs, leading to changes in the extracellular environment of the occurs, including the release of such algogenic agents as histamine, kinins, and prostaglandins. The most critical element in the effective management of myofascial pain syndromes is the correction of predisposing factors. These interfere with the ability of the muscle to fully recover and are the commonest reason for treatment failures. The muscles involved in myofascial pain syndromes are shortened due to the focal contractions of sarcomeric units. It is thought to these focal contractions result in on prolonged ATP consumption and that the restoration of a muscle to its full stretch length breaks the link between the energy crisis and contraction of sarcomeric units. Effective stretching is most commonly achieved through the technique of spray and stretch (Rudin NJ. Evaluation of treatments for myofascial pain syndrome and fibromyalgia. Curr Pain Headache Rep 2003; 7(6):433-42). Injection of trigger points it generally considered to be the most effective means of direct inactivation. A peppering technique using a fine needle to inactivate all the foci within a trigger point locus is the critical element of successful trigger point therapy ( Hong C-Z. Considerations and Recommendations Regarding Myofascial Trigger Point Injection. J Musculoskeletal Pain 1994; 2(1):29-59). Accurate localization of the trigger point is confirmed if a local twitch response is obtained; however this may not be obvious when needling deeply lying muscles. Successful elimination of the trigger point usually results in a relaxation of the taut band. Although dry needling is effective, the use of a local anesthetic (1% lidocaine or 1% procaine) helps confirm the accuracy of the injection and provides instant gratification for patients (Hong CZ. Lidocaine injection versus dry needling to myofascial trigger point. The importance of the local twitch response. Am J Phys Med Rehabil 1994; 73(4):256-63.). There is no evidence that the injection of corticosteroids provides any enhanced effect. A beneficial role for botulinum toxin in trigger point injections has not so far been conclusively demonstrated.